Cryptocurrencies represent emerging financial technologies engendered through overlapping community values of decentralised peer-to-peer exchange, encryption technologies and an overarching agenda towards the disruption of centralised banking within the fiat economy. 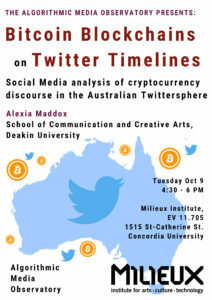 This paper will trace the development and shifts in public discourse within social media surrounding cryptocurrencies. The last five years have seen cryptocurrencies move from technological emergence to a broadening range of applications and history potholed with disputes, divergence, hacks and scams within the community. The accompanying influence of speculation has shifted the focus from social adoption to value volatility and seen the incorporation of associated technologies within banking and other organisational processes. The emphasis within public discourse has also followed a shift from bitcoin to blockchain. 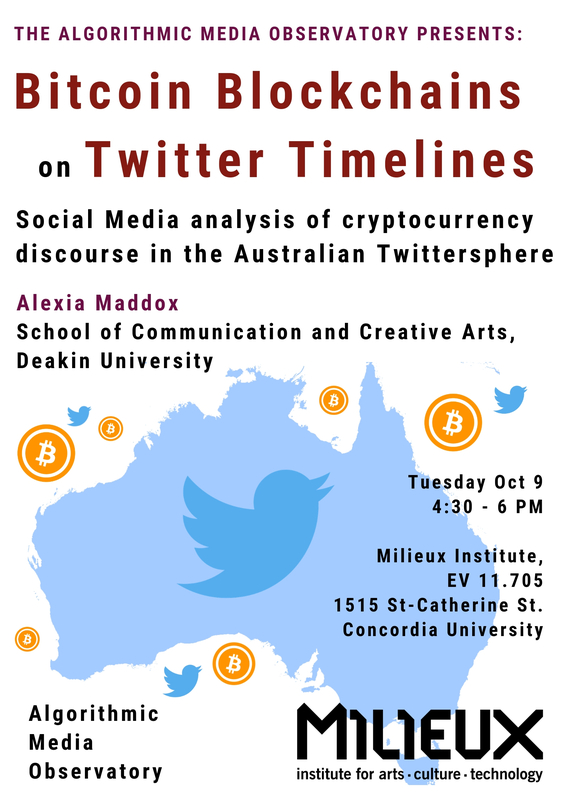 The study is grounded through a Twitter analysis of cryptocurrency-related social media discourse within the Australian context. The social media analysis works with social media archives of the Australian Twittersphere captured between early 2012 to May 2017. Access to this curated archive is through TrISMA and the timeframe under analysis aligns with the most detailed available dataset. The analysis seeks to characterise the emergence of public dialogue surrounding cryptocurrency use and application over time, focusing on peak engagement events. The key concepts directing the focus and interpretation of the social media analysis include financial inclusion, socio-technical disruption and social change. The whimsical quest of the study is to learn where the digital frontier has shifted to within this community and point to possible future developments. From a community studies perspective the case study represents an initial foray into data analytics to explore whether it is possible to detect the shifting shape and form of digital community through its environmental imprint (Maddox 2016). This methodological aspect of the work speaks to an attempt to generate a data recognition practice that can be deployed to search for signatures of social disruption within digital trace data.